You might find hundred resources online that claim that online marketing is easy. The reality is far away from that. Even if you truly believe that your product is the greatest ever, no one would know about it unless you are able to harness powerful channels to tell people about it. So, how do we get there? The first step of the process is content marketing. Providing value to the customer, comparatively much better than the competition. Meanwhile building email lists and other means of connecting with your customers after they leave the site. SendPulse helps you with just that. It provides various solutions to help you get your message across to the right people at the right time. SendPulse is a suite of useful products that comprises of various solutions that are built to help you reach your target audience. The idea behind the app is very fundamental: to make marketing as simple and effective as possible for the online marketer. In this hyperconnected world, your task doesn’t end with delivering content to people. You have to make sure that they read your content. SendPulse helps with this by using a combo of AI technology, hyper-personalization and predictive analysis systems. The two main parameters that you should be concerned with as an email marketer today are delivery rates and open rates. A lot of other email marketing applications promise to send your email newsletters to the intended recipients. This is mainly due to the problem of spam and other filters that are very difficult to get through even though you might consider your content as not spam. Since these mails are inherently sent in bulk, it is difficult to get through in the first place. Provided you get into the inboxes of your intended recipients, the next task is making sure that your recipients actually open and read your emails. It is here that SendPulse shines. It leverages its advanced AI technology to tackle both these tasks and provides the industry’s highest delivery rates and open rates, worldwide. 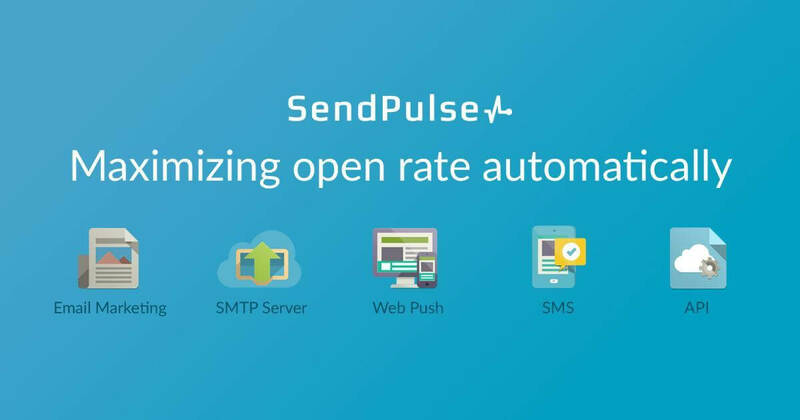 SendPulse claims that their open rates increase by huge margin of over 30% for hundreds of their users, it also includes a feature that resends the email if the original message is not unopened for a specific period of time. This one strategy has in itself contributed to over 30-80% increase in open rates. As an email marketer, my biggest desire is to create beautiful looking newsletters. Ugly looking text emails would lead to your email newsletter being unsubscribed immediately. Don’t worry, SendPulse comes with a huge library of free to use templates that can be used for creating aesthetically pleasing email campaigns. These good looking templates are simple to use and can be customised to suit your needs, based on different industries. You can send seasons greetings to your subscribers in a matter of seconds. If you want a more powerful solution, that has much more possibilities than the built in templates, then you can use the drag-and-drop email editor that is available with SendPulse. You can drag-and-drop custom elements to build a good looking newsletter to reflect your aesthetic sensibilities. The nifty interface is so simple and easy to use that even a newbie can use it with ease. All that you have to do is insert, move, resize and delete the custom blocks that are available for use in the newsletter that you create. The list of built in elements include pictures, buttons, video, social networks and more, all of these come with the ability to customize to change colors, sizes, fonts, line heights and other similar parameters. Just click and drag. Type in the text and insert your own images at will. The emails that you create using the inbuilt email builder are responsive in design, so they’ll fit properly in screens of any size. If you are an advanced user, you’ll be able to use the built in HTML editor or import a template file using an URL. I hope this article helped you in understanding how tools like SendPulse can help you with online marketing. If you have any doubts let me know through the comments and I will clarify it. If you have any suggestions on improving the article, let us know that through the comments as well.